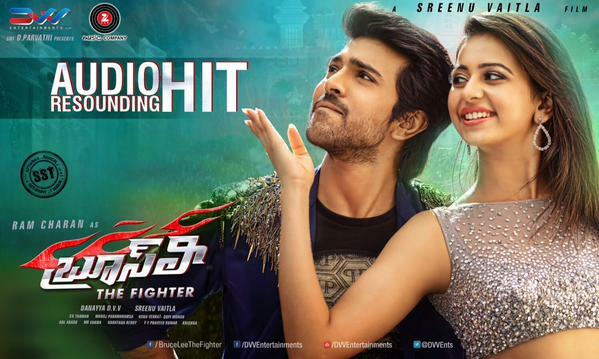 The audio of Ram Charan’s Bruce Lee was launched on October 2nd. The album of this movie is gaining a good response from the audiences.Lechalo,Riya Riya,Kunfukumari are instant chartbusters. SS Thaman scored catchy album with class and mass songs. The album of Bruce Lee starts with this song titled ‘Run’. This song is an energetic number and the lyrics will inspire the youth. Sri Mani penned the lyrics. This song is an instant hit since SS Thaman delivered a different chord. The second song Ria is little bit racy. The catchy English lines are peppy and attract the audiences. The visuals in the movie might help the song and the usage of drums and other modern equipments made this song to hear more number of times. Kung Fu Kumari song is a typical SS Thaman song. This song is catchy and it will become a chartbuster. The usage of Mega Mega is nice and it will attract the Mega fans. Ram Charan’s dance moves will add beauty to this song. Lechalo song is the best song in this album. The makers of this movie released a video of this song. One of the best compositions in Thaman’s career and it will become a hit song. You will like this song!! This is the title song in this movie and it is an out and out mass number. SS Thaman managed to deliver a masala song, which will attract the mass audiences. Mass beats and Ram Charan’s dance moves will be the highlight of this song.